The California Coast Classic is the Arthritis Foundation’s nationwide signature event that unites communities across the country to put an end to arthritis. We aren't just helping the millions of people with arthritis to live better; we're charting the course to a cure. READY...SET...PEDAL! Cyclists begin in San Francisco, into the tiny town of Davenport (stop for a sandwich or pie!) and catch a tailwind into Santa Cruz, completing a total of 85 miles and 5100 feet of elevation. This leg of the tour measures 51 miles/2000 feet and takes you through the dramatic landscape of the California countryside, into Cannery Row before resting for the night in picturesque Monterey. Say goodbye to Monterey and head south. A short 46 miles/2800 feet will bring you into a spectacular landscape of Big Sur forest and incredible vistas. Stick your feet in the river at the River Inn just two miles before camp! Absolutely beautiful! If the pedaling doesn't take your breath away, the scenery will! 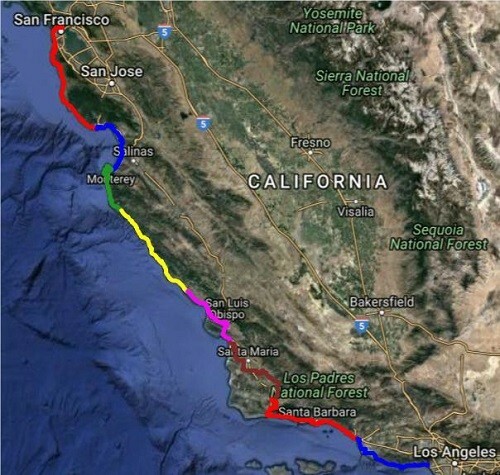 At 53 miles/1700 feet, this stage takes us along world famous shoreline through Cayucos, Morro Bay and into Pismo Beach.